New Delhi: The All India Football Federation (AIFF) has got down to tapping sponsors to raise a whopping 25 million USD as FIFA guarantee for bid to host the Club World Cup back-to-back in 2015 and 2016. Interestingly, India is hosting the FIFA Under-17 World Cup a year later in 2017 and looking at the two events cumulatively, the AIFF has a major challenge to find sponsors. The AIFF has to submit the bid for hosting the Club World Cup by Aug 25 and the FIFA executive committee will select the host in September 2014. AIFF secretary general Kushal Das told IANS that it is indeed a challenge but hoped the demands would be met. 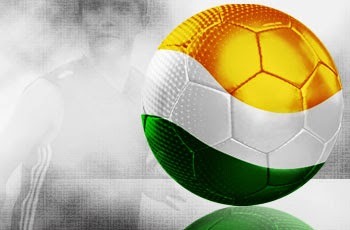 "It is a tough challenge indeed for the AIFF to raise such a huge amount of 25 million dollars. But we are confident that we would get the required guarantees for FIFA. For that, we have to sell six local packages (local sponsors), which are not in conflict with FIFA sponsors," Das told IANS Tuesday. The Club World Cup will be a dress rehearsal for the Under-17 event, but the worry is whether the AIFF, which operates on a shoe-string budget, would be able to meet the financial demands for the Club World Cup in such a short span of time. The gross budget of AIFF is reportedly around Rs.57 crore, including Rs.35 crore it receives annually from its commercial partners IMG-Reliance. The AIFF in 2010 had signed a Rs.700 crore deal with IMG-Reliance for a period of 15 years, one of the most lucrative deals in Indian sports. Trade analysts feel that for AIFF guaranteeing $25 million to FIFA in revenue generation from the Club World Cup is tough but not impossible since European clubs have a huge fan following in India. "The European leagues, especially English Premier League (EPL) and the Spanish Primera Liga are immensely popular in India. So it may not be impossible for the AIFF to generate the huge amount but we have to see how the market reacts significantly," Jaideep Ghosh, partner KPMG India, told IANS. India will also face stiff competition from Asian football powerhouse Japan in the race to host the FIFA Club World Cup in 2015 and 2016. Earlier this month, AIFF president Praful Patel met FIFA boss Sepp Blatter here to discuss the possibilities of hosting the 2015 and 2016 Club World Cup.